Above all else, you need your home and your business to remain secure. While you should feel safe in every aspect of your life, securing the place you sleep in and the place you make the majority of your money in carries quite a bit of weight. The truth is, you shouldn’t be trying to feel safe—you deserve to be safe in these places that are supposed to provide comfort. That’s why you should trust all of your security needs and concerns for your business to the best locksmith in Philadelphia: Lockman. At Lockman, we have an intimate understanding of how important uninterrupted security is for our community members to function. You need feelings of security to be able to perform at your peak in your daily work and relationships. You need to be secure to function at a comfortable level. Our job is to make sure that you sleep easy at night knowing that your business and livelihood is just as safe as you are in your cozy bed. While it may seem that windows are beyond the department of locks, it’s not. A proper locksmith’s responsibility is optimizing the entirety of your security. Our locks only work well if all the other bases are covered and a large percentage of burglaries happen because of poor window security. Windows are one of the most targeted areas because they’re the most fragile port of entry in your home and the breaking of glass is often too quiet for a neighbor to hear.. Most windows aren’t equipped with locks, they’re only equipped with latches, which are rather easy to break by merely exerting force on the frame of the window. The key to improving your all-around security is first through you weakest port of entry. Enter burglary proof windows. Neglecting your window security is equivalent to neglecting the entire house’s security, as it’s the weakest link. Breaking down the improvement of your overall security starts with identifying the bad link in the chain, and in regard to windows, there’s a variety of those. There's a reason you see teens sneaking into their girlfriend’s house at night through the window. It’s because it’s absurdly easy. Most windows are really easy to tamper with, and if they’re on the ground level, they’re easy to reach. This problem is exasperated when you neglect your window coverings. We’re not saying you need to invest in some 70s style valances, but some blinds would go a long way in deterring a thief because if they can’t literally window shop your house, you’re already ahead of the game. Merely remember to pull the blinds down whenever you’re not seeking the natural light or you’re out of the house and you’ll significantly reduce the likelihood of a burglary at all, let alone one through your windows. The best place to start would be on a set of locks that can actually protect your residence’s windows. While it’s a great general rule to change your locks when you’ve moved into a new home, it’s an even better idea to change your window “latches” which are really just useless switch mechanisms. Your residential locksmith in Philadelphia has more than enough experience teaching people how to create burglar-proof window solutions, rather than fall prey to the lack of preparation. While you can always invest in new locks for your windows, you can also put some money into a few window sensors for your ground level windows. A window sensor will tell you about any unknown movement near the window and can be activated and deactivated when you’re wanting to open the windows when you’re in the room. This can be a huge prevention tool but some new locks are a great first step. There are plenty of folks who are under the impression that security cameras are essentially a cure-all for security. It’s not a one-size-fits-all solution to security for both your commercial and residential needs. The simple basis of a security camera implies that the camera monitors a very specific area that you, or the person that installed this security system, deems as the most important area to monitor. Specifically, it monitors every precise area for unknown movement and activity. At best, your security camera merely observes what’s happening outside of your house and unless you regularly monitor these interactions outside your home, you likely won’t have much of an idea about what’s going on outside of your door. In fact, you likely won’t know what happened during a burglary until after it’s happened. In short, security cameras will only serve to deter inexperienced thieves and in a large city like Philadelphia, there are plenty of experienced thieves running around that your house could fall prey to. After all, if security cameras were so effective, then gas stations (with their litany of monitoring equipment) wouldn’t be one of the most commonly robbed business establishments. In short, all you need to do as a thief if you’re worried about a security camera is wear a mask so you can’t be identified after you’ve taken what you want. To Lockman, that doesn’t sound like it’s quite to the foolproof security measure that cameras claim to be. If you’re pondering the real value of your security cameras, you might pause to think about the possibility that, while they’re supposed to deter theft, they could, in themselves be stolen? The thing about thieves in bigger cities is that they’re probably professionals. If they’re doing this on a regular basis and with a certain level of skill, they likely know more about your security camera system than you do. They’ve seen a number of different security camera systems, they’ve done hours of research to prepare themselves for encountering different kinds. They certainly know how to trick the camera if not just disable it entirely, and sometimes all that entails is taking the unit itself. This renders them a rather ineffective deterrent. While we’re sure that the presence of security cameras does discourage amateur thieving it’s hardly put a permanent stop to it. For commercial security, there are repeated instances of employee theft, which is often mainly deterred by security cameras. These specific thieving actions mainly occur multiple times before the individual is caught, which means that, as a whole, security cameras are at best passive protection against general stealing but they’re hardly the best way to protect your assets. Locks have been around for literally thousands of years. Egyptians started using them to defend tombs and goods and they’ve been popular to protect what’s yours ever since. They remain the very definition of “tried-and-true” solutions to thievery and they’re all based on a simple principle: Restricted Access. Most security measures are really more like suggestions to a thief that they shouldn’t mess with your building. They’re the equivalent of having a pocket knife and a chain hanging off your belt. Instead, invest in powerful, high-tech locks that are meant to stop thieves from the moment they have the inclination to take what’s not theirs. While there’s a selection of mortise cylinder and rim cylinder locks that you can employ to take advantage of a more advanced locking system for your commercial locksmith needs, you could invest in multiple keyed locks that you can easily restrict and allow access to employees. It can be as simplistic and elegant as a keypad or smart lock that allows you to toggle access according to certain times and other factors. Lockman can even outfit you and your managers with master keys to keep everything in your commercial building safe and sound from potential thieves. The same goes for residential protection as well. Lockman has a huge variety of locks and security measures that are practical, physical and super capable of keeping you and your possessions safe in your home. Don’t trust a lens, trust a couple of clever locks and deadbolts instead. Most security information and statistics are all based on the dreaded “entry-point,” or how a thief enters a space you don’t want them to be in. Locks aren’t really your first line of defense, they’re the thing bolstering your first line of defense, which is your door. If your door has a poor protection rating, your ultra high-tech lock won’t do much in the way of protecting you. It’s really all about the material of the door you have currently. If your front door is hollow and wood, it’s probably easier to just kick in your door than it is to actually try to pick the lock. 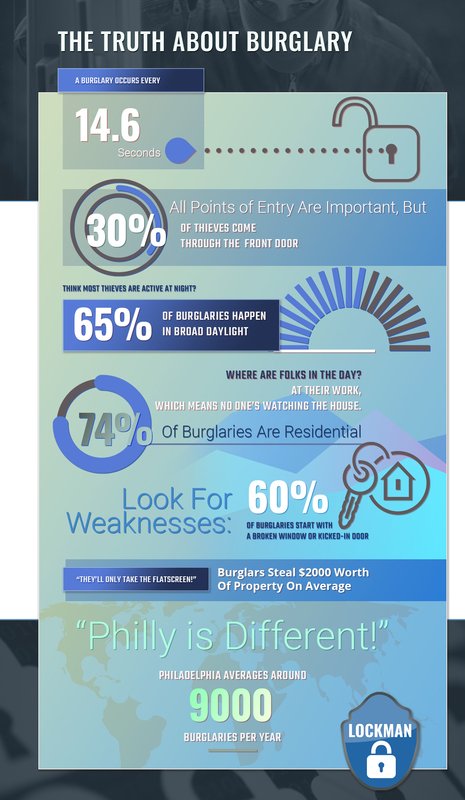 If your Philadelphia neighborhood is experiencing more break-ins or you’ve recently experienced an attempt (successful or not), Lockman recommends turning to your door first. Steel is the best choice for a door’s security and is pretty standard for most commercial spots, so whatever money you put into locksmith related security with this door already equipped, you’ll be pretty invincible. But if you’re looking for residential locksmith solutions and a more aesthetic appeal we highly encourage looking into fiberglass solutions. It has better insulation, which is great for keeping an even temperature, it’s more attractive than steel and is just as strong as steel. It’s rare that a material caters both to security and aesthetic, but fiberglass has everything going on for it. As we mentioned, doors are a huge portion of your security in both a residential and commercial capacity. For a commercial business though, the front door is the first impression future clients and customers get of your business. Thus, it’s important that you pull off a welcoming entryway, while still protecting what's yours. Luckily, you don't have to have someone try to break in through your front door to find out how effective your current commercial lock situation is. You can base the strength of your current security system on a couple of factors that will help you determine if you’re due for an upgrade, or if your business is doing just fine. The main factor you’ll need to worry about, other than if your door’s deadbolt is just gone, is the construction of the actual door itself. Your lock is only as good as the door it’s attached to, so if it’s made out of a material that is closer to styrofoam than wood, you might consider replacing the door before addressing the locks. After that, assess the safety and security of your current lock. Try looking up your model of lock, chances are you’ll find potential tutorial videos on how to pick it “in case of emergencies.” If you don’t find it, it’s likely safe to assume that your current lock is in good shape. Though, you might reach out to Lockman and chat with us about modern options and what our expert opinion is of your current lock, especially if you’re growing more concerned about losing commercial property. Convenience, pick and bump resistance are all fairly self-explanatory features. Key control goes hand-in-hand with anti-pick locks and the convenience factor in that the lock needs to be able to adapt easily to your keying needs. That means it can adjust for different kinds of keys and provide a master key for you, the owner, and anyone else you need to have it. If it’s more secure than that, you might look into placing it somewhere else in your store to protect the higher priced items. While the front door needs to be secure, you’ll still need to be able to let the opening shift get access so the business can get up and running in the morning. Bypass Protection is likely the most important feature you can access in a commercial lock. Locks that come with easy bypasses are not worth your money and put your commercial establishment at risk. Bypasses usually come in the form of gaps between the two doorways and claim to make it easier to let locksmiths into the lock if the door should be locked. You can make bypasses safer by removing the thumb turn portion of the lock on the other side of the door, but it's better to ensure that are no bypasses within your lock, or your door. If you keep these simple guidelines in mind, you’ll be able to choose a lock that suits you best, or you can always reach out to the professional locksmiths at Lockman and ask for our opinion. We’re happy to help you secure your commercial space with superior locks. Don’t put the security of the things that are associated with your well-being into just anyone’s hands. Place your faith in the hands of Lockman. We’re eager to help keep you and your family secure at night because we care deeply about the continued safety of our community. 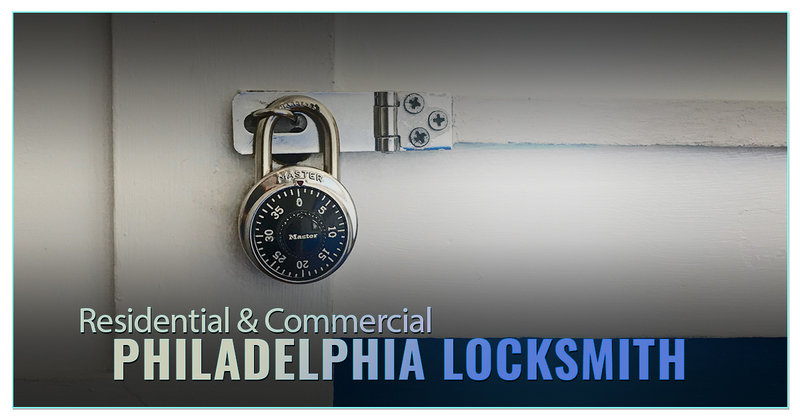 Please feel free to reach out to us and schedule an appointment with our expert locksmiths who can help you create an air-tight security plan for your entire home and your commercial business in Philadelphia. Together, we can make our city safer for everyone in it.